Android operating system seems to win the battle over iOS, at least in the American market share. At least, that's what a latest research says. 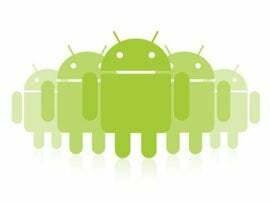 According to Nielsen's research, 51.8 % of US users that own a smartphone are choosing Android as their operating system. 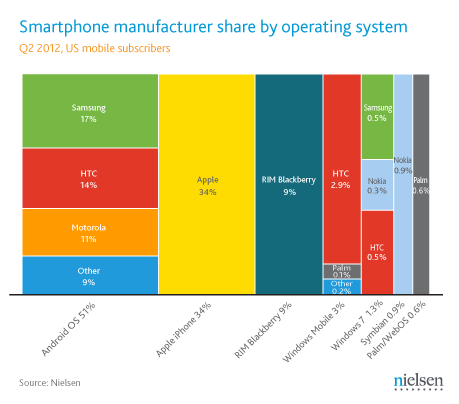 Apple comes second with the 34.3% of the market share, while RIM by Blackberry is third with 8.1% of the market share. Although the figures might be surprising for some of you, in fact they shouldn't be. We all know that iPhones dominate in the industry, but we also know that Android is a big competitor. Although their constant battle does not always have a clear winner, in this case the numbers can be justified by the fact that Android is used by many smartphone brands. Also, the fact that Android smartphones are cheaper, at least statistically, than the iPhones, makes users prefer the cost-effective choice. Android's percentage of market share consists of Samsung, HTC, Motorola and other smartphones. On the contrary, when we are referring to iOS, we know that it's only iPhone that includes the specific operating system. Despite its higher price, iPhone is still in high esteem and that's why the stand-alone percentage of 34% should not be underestimated. After all, times are changing and we are not sure whether the numbers will be the same by the end of the year. We might not be able to predict the winner, and whether it will be a clear victory, but we can tell that the release of Apple's new iPhone and Samsung's Galaxy S III will affect the current graph.